It’s been less than a week into my 5-Month Paleo Challenge and I have to say it’s been going alright. 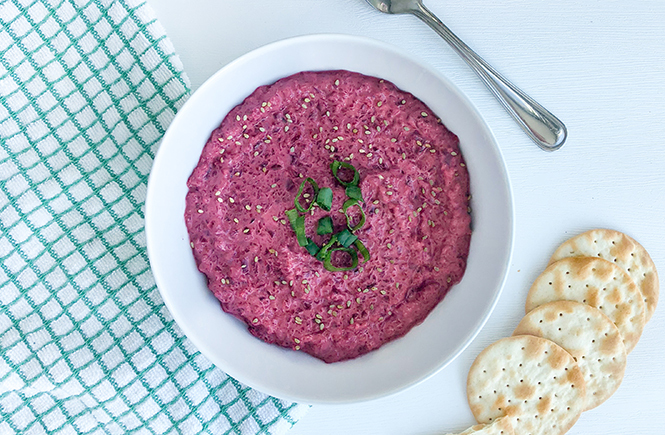 Having the right snacks is the toughest part for me which is why I’m excited to share this simple, paleo-friendly Beet Hummus recipe! For those of you who aren’t paleo, I also have a an amazing addition to this recipe that you will love – goat cheese. I’m a fan of good ole’ chickpea hummus but sometimes you gotta mix it up!